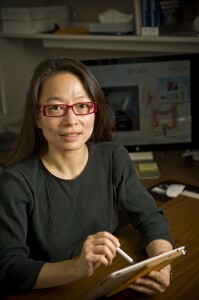 Wright State engineering professor Caroline Cao is the Ohio Research Scholar for the Ohio Imaging Research and Innovation Network. It was post-war Saigon—deep in the night. Ten-year-old Caroline Cao and her family quietly slipped out of their home and made for the coast. They were among the “boat people,” a tidal surge of refugees leaving Communist-controlled Vietnam in vessels of all shapes and sizes following the Vietnam War in the late 1970s. Today, Cao has brought her talents to Wright State University. The Ohio Research Scholar for the Ohio Imaging Research and Innovation Network (OIRAIN) and expert in human factors of medical systems is a professor in biomedical, industrial and human factors engineering. But the memories of her harrowing exit from Vietnam are never far from the surface. As Cao’s boat cruised away from the Vietnam coast into the unknown, survivors from another vessel that had been damaged at sea sardined their way aboard. Finally, they found safe haven in the Philippines. After spending three months in a refugee camp there, Cao and her family arrived at their new home in Vancouver, thanks to the United Nations. They were among the first boat people to come to Canada. Cao later attended Simon Fraser University in Vancouver and seemed on her way to a career in dentistry when she became interested in scientific research. After her father suffered a brain aneurism that left him in a coma, and later on the road to rehabilitation, Cao elected to pursue rehab medicine. She focused on finding better ways to help patients recover their motor skills. Cao obtained her doctorate at the University of Toronto and then went to Tufts University near Boston, where she was director of the human factors program as well as a faculty member of the mechanical engineering department. She won the prestigious National Science Foundation (NSF) CAREER award in 2003. The field of human factors engineering is applying the understanding of human capability in the design and development of technology and other systems to improve performance and safety. Specifically, Cao is an expert on the use of imaging techniques, visualization, and haptics in training physicians to do minimally invasive surgery. Instead of the conventional surgical method of cutting open the abdomen and manipulating the tissues with the hands or surgical tools, tiny incisions are made, a miniature camera inserted and the operation performed with tiny chopstick-like instruments while watching the camera images. Recovery time for the patients is much faster. To train physicians, Cao has helped design surgical simulators. The simulators make it unnecessary to use and sacrifice animals to practice on or to build expensive inanimate models that resemble tissue. Cao–a marathoner and former dancer–will be one of the key researchers to be housed in the planned Neuroscience and Engineering Collaboration (NEC) Building, a $37 million project in the research corridor of the Wright State campus. The NEC building will enable her to bring her medical human factors and imaging expertise to the table and collaborate with neuroscientists, engineers and neurologists to commercialize research discoveries and improve the diagnosis and treatment of neurological disorders such as stroke. “I think it will be amazing,” she said.